Usually, April means the annual Scandinavian Festival is around the corner. Sadly, this year it is not happening. In November 2015, the Scandinavian American Cultural and Historical Foundation Board of Directors voted to postpone the 42nd Annual Scandinavian Festival until 2017. It seems they found themselves with not enough time to plan properly for this year. They promise to be back in 2017 “with a 42nd Festival of which we will all be proud!” However, there are many other events and activities to broaden your cultural understanding and appreciation of our area, and another of my favorite LA events is also on this month, the Los Angeles Times’ Festival of Books. The Undiscovered Chinatown Tour, Chinatown, Downtown, Saturday 4/2, 10:30am-1pm. Visit a temple, an herbal shop, art galleries, antique stores, and more when guided to the unique treasures–not to mention great bargains–to be found in Chinatown. Wear comfortable walking shoes and be prepared to wind your way through a myriad of alleyways, plaza stalls, and classical courtyards to discover the charm of L.A.’s Chinatown. This tour is offered every first Saturday of the month. Barnsdall Art Sundays—Austria: Hundertwasser Inspired Painting, Junior Arts Center at Barnsdall Art Park, Hollywood/Los Feliz, Sunday 4/3, 10am-12pm. Join instructor Quan Trang for a free family art workshop in a real art studio. All materials are provided. Each Sunday a different culture and media are featured. 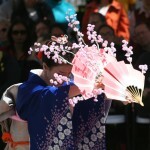 Japanese Cherry Blossom Festival, Bowers Museum, Santa Ana, Sunday 4/3, 11am-3:30pm. Join the Bowers Museum in celebrating the Japanese Cherry Blossom Festival with art, music, and dancing. Andell Family Sundays—Poetic Printmaking, LACMA, Sunday 4/3, 12:30pm-3:30pm. After exploring how Japanese printmakers added poems to their scenes of life and landscape in 18th- and 19th- century Japan in the special exhibition Living for the Moment: Japanese Prints from the Barbara S. Bowman Collection, write poetry, make music, and learn printmaking in art workshops. Also 4/10, 4/17, and 4/24. 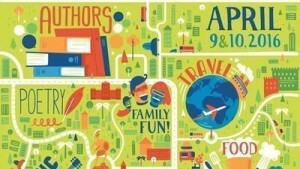 Festival of Books, USC Campus, Downtown LA, Saturday 4/9 and Sunday 4/10. Enjoy two days of not only books and authors, but also music, food, art, culture, and fun. The Festival of Books is Los Angeles Times’ annual celebration of ideas, creativity, and the written word. The Festival brings book lovers and fun seekers of all ages together with their favorite authors, artists, chefs, musicians, and entertainers. Go Metro and avoid the hassle of finding parking. You’ll also save 10% on your total purchase of official 2016 Festival of Books merchandise, including mugs, T-shirts, and more. The Expo Line will drop you directly at the south end of the festival. For more information, see the Program Guide, the official program for the festival with articles, a map, schedule, exhibitor list, and more. 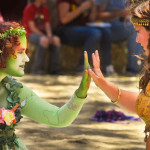 Renaissance Pleasure Faire, Santa Fe Dam Recreation Area, Irwindale, Saturdays & Sundays, April 9 to May 22. Travel back to the 16th century and experience the glory of life during the Renaissance era. There will be artisans of all media, entertainment galore, food trucks and booths, games and rides (including pony and camel rides), a Kids Kingdom (with games, crafts, story-telling, song, shows, and characters), and a gnome quest! 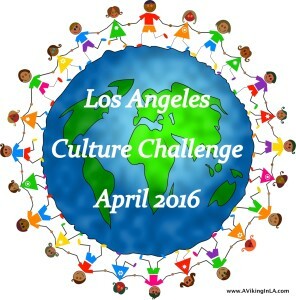 International Children’s Day Festival, Aquarium of the Pacific, Long Beach, Saturday 4/9 & Sunday 4/10. Celebrating the amazing talents of children of all cultures, this festival features West African, Mexican, Pacific Islander, Cambodian, Chinese, Korean, Japanese, and Persian dance performances. Enjoy performances by a children’s choir and martial arts demonstrations. Kids of all ages can partake in an international percussion circle, face painting, and Native American and Pacific Islander traditional children’s crafts and games. 18th Annual Chumash Day Powwow and Inter-Tribal Gathering, Malibu Bluffs Park, Saturday 4/9 & Sunday 4/10. 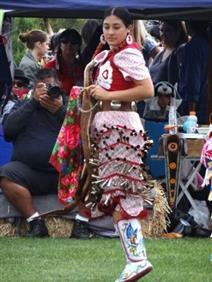 This year’s 18th annual Chumash Day Powwow will celebrate Native Americans from all over the country. Hundreds of tribes will gather at Malibu Bluffs Park. Native American food, craft vendors, tribal ceremonies, and dances will be a part of the event on both days. Grand Entry will take place 1pm at Saturday and 12pm on Sunday. Barnsdall Art Sundays—Thailand: Thai New Year Elephant Patch, Junior Arts Center at Barnsdall Art Park, Hollywood/Los Feliz, Sunday 4/10, 10am-12pm. Join instructor Sofia Mas for a free family art workshop in a real art studio. All materials are provided. Each Sunday a different culture and media are featured. Andell Family Sundays—Poetic Printmaking, LACMA, Sunday 4/10, 12:30pm-3:30pm. Check out how Japanese printmakers added poems to their scenes of life and landscape in 18th- and 19th- century Japan in the special exhibition Living for the Moment: Japanese Prints from the Barbara S. Bowman Collection. Then write poetry, make music, and learn printmaking in art workshops. Also 4/17 and 4/24. 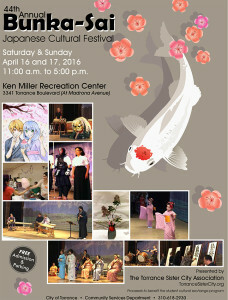 44th Annual Bunka-Sai Japanese Cultural Festival, Ken Miller Recreation Center, Torrance, Saturday 4/16 & Sunday 4/17. Come enjoy Japanese culture at the Bunka-Sai Festival sponsored by the Torrance Sister City Association. There will be an anime contest; Kamishibai storytelling; Aikido, Judo, Kendo, Naginata, and Karate; Koto, Taiko, Minyo, Shamisen, and Odori; Ikebana and Bonsai; Shodo calligraphy and tea ceremony; Origami, Roketsu, and Kimekomi Ningyo Dolls; arts and crafts boutiques, games for children, hourly drawings; and food. Andell Family Sundays—Poetic Printmaking, LACMA, Sunday 4/17, 12:30pm-3:30pm. Check out how Japanese printmakers added poems to their scenes of life and landscape in 18th- and 19th- century Japan in the special exhibition Living for the Moment: Japanese Prints from the Barbara S. Bowman Collection. Then write poetry, make music, and learn printmaking in art workshops. Also 4/24. 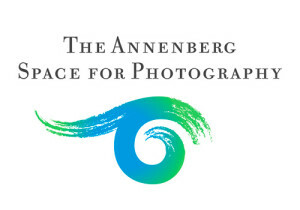 REFUGEE, The Annenberg Space for Photography, Century City, opens April 23 and continues until August 21. Through images created by five internationally acclaimed artists, REFUGEE explores the lives of refugees from a host of diverse populations dispersed and displaced throughout the world. The exhibit features photographs taken in Bangladesh, Cameroon, Colombia, Croatia, Germany, Greece, Mexico, Myanmar, Serbia, Slovenia, and the United States. 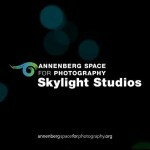 New Americans, Skylight Studios, Century City, opens April 23 and continues until August 21. In conjunction with the REFUGEE exhibit, the New Americans installation at Skylight Studios features a collection of stories on refugees who were resettled in the United States to start a new life through the U.S. Refugee Admissions Program. The installation features “The Refugee Project,” an interactive visual narrative created from 40 years of UNHCR refugee data; New Roots, a long-form multimedia experience by visual journalist Sarah Ann Jump featuring a Congolese refugee family resettling in Rochester, New York; several short films of refugee families sharing their experiences as they resettle in California and adapt to their new lives; and a photo series by blogger and photographer Brandon Stanton of Humans of New York which features the personal stories of refugees recently cleared for resettlement in America. 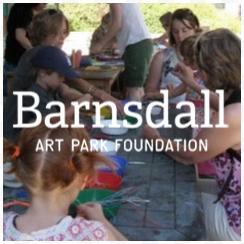 Barnsdall Art Sundays—Armenia: Pomegranate Vase, Junior Arts Center at Barnsdall Art Park, Hollywood/Los Feliz, Sunday 4/10, 10am-12pm. Join instructor Sarah Hage for a free family art workshop in a real art studio. All materials are provided. Each Sunday a different culture and media are featured. Art of the Austronesians: The Legacy of Indo-Pacific Voyaging, Fowler Museum at UCLA, opens Sunday 4/24 and continues until 8/28. Art of the Austronesians explores the history and development of the arts and cultures of the Austronesian-speaking peoples—from their prehistoric origins in what is now Taiwan to their successive seafaring migrations over millennia throughout the Philippines, Indonesia, the Pacific, and beyond. The first major exhibition in the United States to examine the visual arts of the entire Austronesian world comparatively in a single project, it features a number of important pieces from the Fowler’s. Additional works borrowed from private California-based collections, many on view to the public for the first time, contribute to the remarkable breadth of the installation. Andell Family Sundays—Poetic Printmaking, LACMA, Sunday 4/24, 12:30pm-3:30pm. Check out how Japanese printmakers added poems to their scenes of life and landscape in 18th- and 19th- century Japan in the special exhibition Living for the Moment: Japanese Prints from the Barbara S. Bowman Collection. Then write poetry, make music, and learn printmaking in art workshops. Thank you! I’m looking for things to do with my 13-year-old daughter during this spring break, and you’ve given me some great information. Last year we went to the Scandinavia Festival and I’m disappointed we can’t make a return visit this year. But there’s 2017…Thank you for the information about that, too!